I can still remember my childhood astonishment after suctioning pond water into an eyedropper, squeezing out a quivering droplet under a microscope – and watching a hidden universe explode with swimming, squirming organisms bashing into each other like bumper cars. 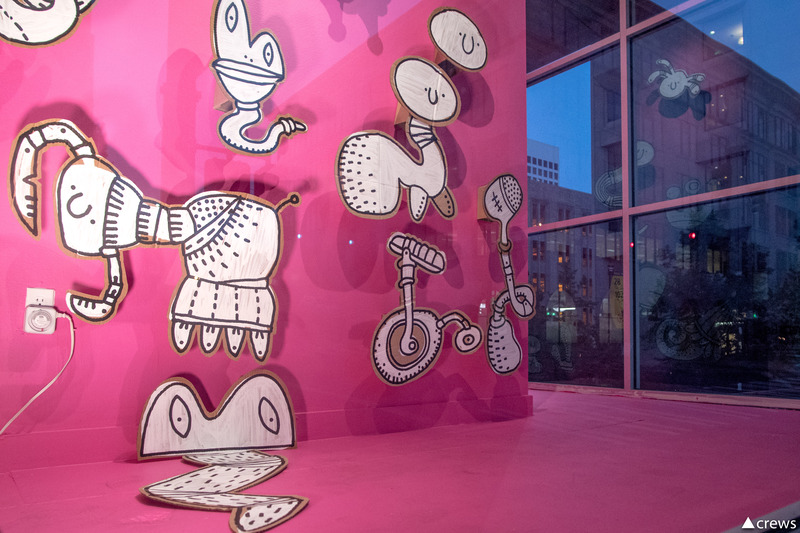 That same happy sense of discovery pervades Bismo’d, an art installation by Pete Goldlust on view at the Woolworth Windows, Broadway and S. 11th St., through November. “I strive to produce work that fosters a sense of wonder, joy, and play. I look to draw out these qualities, often dormant within the history of each site,” said Goldlust. Smiley-face bacteria swarm across Bismo’d (the name refers to the bubble-gum pink antacid), and hybrid crosses of humans with household appliances and widgets are rampant. A worm-like creature with a microphone for a head shimmies next to a dancing squid in pantaloons; meanwhile, something resembling a plumbing fixture peers on with the eyes of a frog. Goldlust’s work extends an irresistible invitation to free associate, and its broad appeal has landed it in publications as disparate as Art in America, Ripley’s™s Believe It Or Not!, ELLE Belgium and Raising Arizona Kids. An accomplished sculptor, Goldlust has worked on a scale from 4″ to room-size. His elegant Carved Crayons take Crayolas to a new level, evoking a colorful series of pocket-size Brancusi sculptures. Lovebirdland, a collaboration with Mary Lucking in Loveland, Colorado, features a cartoonish garden scene executed on concrete relief panels that run along a bikeway. commissioned by the City of Loveland, CO. Since receiving an MFA from the School of the Art Institute of Chicago, in 2001, Goldlust has exhibited widely with solo shows at galleries in Chicago and Los Angeles. He has been awarded public art commissions in Arizona, California, Colorado and Iowa, and enjoyed international exposure. He and his wife and collaborator, Melanie Germond, and their two young sons recently relocated from the small artist community of Bisbee, Arizona, to Eugene, Oregon, where they “are currently enjoying the novelty of being rained on.” The move has enabled Goldlust to keep “looking under rocks for weird wiggly things” that will find a new home in his work. 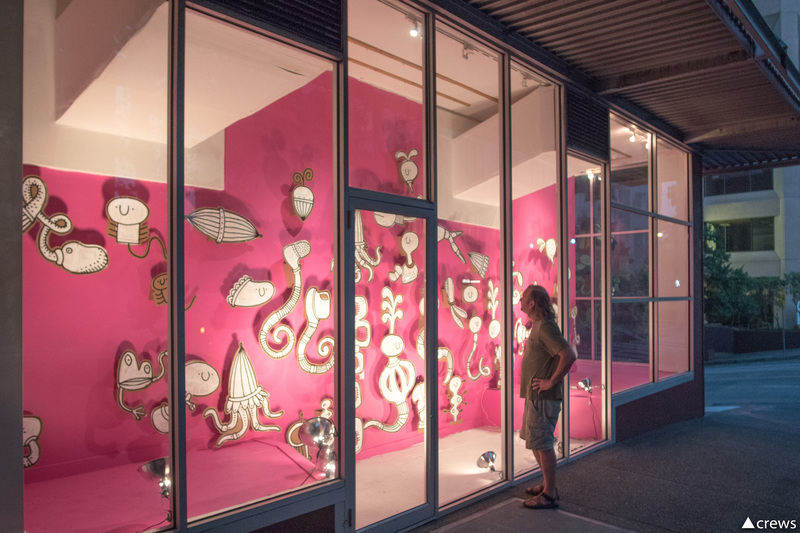 Bismo’d by Pete Goldlust, at the Woolworth Windows, Broadway and S. 11th St., through November, 2017.